152 mm/50 Type413 х 2 pcs. 76 mm/60 Type892 х 2 pcs. 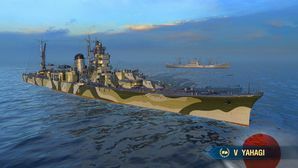 Yahagi — Japanese Tier V cruiser. One of the Agano-class light cruisers – the new generation of ships designed to replace cruisers built in the 1920s. She was relatively small, quick, and sported powerful torpedo armament. Yahagi (矢矧) was an Agano-class cruiser which served with the Imperial Japanese Navy (IJN) during World War II.